… to the dear William Kelley Woolfitt about my nonfiction chapbook, Geography V. You can find the interview on Speaking of Marvels, a magnificent blog devoted to the celebration of (too-)oft-overlooked shorter literary forms and collections, such as the chapbook and the novella. In the interview, you’ll be able to read my thoughts on such important topics as language, love, loss, cartography, my complicated relationship with Elizabeth Bishop, and my tendency to listen to the same angsty cds over and over again. 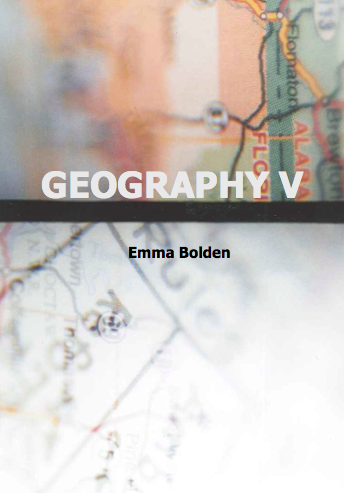 In celebration, I’m offering a limited-time-only deal on Geography V. For $15.00 (shipping included! ), I’ll send a signed copy of the collection your way along with a hand-made bookmark. I may also possibly include a postcard that says something angsty about love. Haiku may be involved. Perhaps glitter. Brace yourself. This is adventurous stuff, y’all. For more information about the aforementioned limited-time-only deal, you can send me a Tweet at Emmabo or a Facebook message or you can use the e-mail form on bottom of the front page of my website, locatable by scrolling. So many options. ADVENTUROUS STUFF. Thank you again, Will, for these marvelous* questions! ← We Should Hang Out.